Thanks to long-standing appreciation in homes, well-funded retirement accounts, and hefty life insurance policies, many retirees today not only have enough money to live comfortably, they are also likely to have wealth to distribute at the end of their lives. But it can be tricky making sure your bequest gets where you want it to go. Here are nine common mistakes to avoid. 1. Assuming you don’t need an estate plan because you don't owe estate tax. With estate tax laws in flux, whether your estate is large enough to owe estate taxes may depend on when you die. But even if taxes aren’t an issue, estate planning can ensure your assets are controlled according to your wishes if you’re incapacitated and parceled out appropriately at your death. It can also help to avoid the cost and delay of probate and minimize emotional and financial burdens on your beneficiaries. 2. Not having a will. Without a will, state law will govern the disposition of your probate estate, with the government deciding who gets what. Depending on your state of residence, if you are survived by a spouse and children, your estate will typically be divided among them even if you had something else in mind. Moreover, assets could be poorly managed and your estate could end up paying more than it should in taxes and legal fees. A will lets you specify who gets what and could help minimize estate taxes. 3. Not having a letter of instruction. If you change your mind about who gets your favorite jewelry or whether you want to be buried or cremated, you can note these wishes in an addendum to your will called a "letter of instruction." 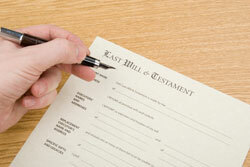 Though not legally binding in all states, it will tell your heirs your wishes and help them avoid needless conflicts. 4. Leaving your entire estate to your spouse. While many couples leave all assets to one another, that’s not always the best strategy. You may want some property to pass directly to children from a previous marriage, or to go into a trust to make use of both spouses’ estate tax exemptions. Trusts, which come in many varieties, may help you fine-tune your estate plan, are typically less vulnerable than wills to legal challenges, and can provide asset protection. 5. Owning all assets jointly. Most couples own property jointly, with rights of survivorship—meaning that upon the death of one spouse, the jointly owned property automatically passes to the surviving spouse, avoiding probate. But this may not be the best choice in all situations. For example, owning property separately could make it possible to fund a trust and take better advantage of the estate tax exemption. 6. Not considering annual gifts. Using yearly gifts to distribute your estate while you’re living can be immensely satisfying, and it takes advantage of an annual gift tax exclusion that allows you to make tax-free gifts each year of up to $14,000 (in 2017) each to an unlimited number of recipients. (If you give with your spouse, the limit is $28,000.) You can use your $5.49 million lifetime gift tax exclusion (in 2017) to make even larger gifts. And any gift now avoids potential estate taxes later. 7. Failing to consider the benefits of charitable contributions. Fulfilling your philanthropic goals can also have many tax benefits. Your estate can take a deduction for gifts—including cash, personal property, real estate, and certain investments—made to charitable organizations upon your death. (Charitable gifts during your lifetime are also deductible and reduce the size of your taxable estate.) Other options to consider are a charitable remainder trust that pays a lifetime income to you and distributes remaining assets to a charity at your death, or a charitable lead trust, which reverses the equation, paying the charity now and your heirs when you die. And you might use life insurance to “compensate” family members for the part of their inheritance that goes to charity, if you are insurable and inclined to do so. 8. Keeping life insurance in your taxable estate. Life insurance benefits aren’t taxed as income but they do go into your estate and could increase your heirs’ estate taxes. A better option may be to have your policy owned by an irrevocable life insurance trust that can pass along proceeds without tax liability. 9. Failing to update estate strategies periodically. Everyone’s circumstances change. Your wealth may increase or decrease, new children may be born while others reach adulthood, and you could be widowed or divorced and remarry, adding the complications of a second family. Regular reviews can make sure your estate plan keeps up.